DUSHANBE (Asia-Plus) — On Tuesday February 5, visiting Russian Foreign Minister Sergey Lavrov was received by Tajik President Emomali Rahmon. 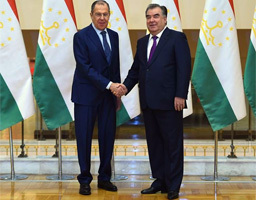 In the course of the talks, Rahmon reportedly noted that Tajikistan attached significance to its cooperation with the Russian Federation. The two sides discussed a broad range of issues related to political integration, regional security, border protection, fight against terrorism, the program of modernization of Tajikistan’s armed forces, and the current situation in the neighbouring Afghanistan. Both sides underlined the necessity of resolving the issues of trade and economic cooperation between the regions of the two countries, use of new technologies for processing industrial goods, cotton as well as fruits and vegetables in Tajikistan. Rahmon and Lavrov also discussed construction of Russian-language schools in Tajikistan and deployment of Russian teachers to Tajikistan. They also discussed problems of labour migration and preparations for Tajik President’s visit to Russia, the website said. Lavrov hold talks with Foreign Minister Sirojiddin Muhriddin to prepare for a bilateral summit and high-level meetings in 2019. The two foreign ministers also discussed the regional security situation and sign a program of cooperation between their departments.